An international team, led by an archaeologist from the University of Southampton and the University of Bordeaux, has revealed the first example of Palaeolithic figurative cave art found in the Balkan Peninsula. 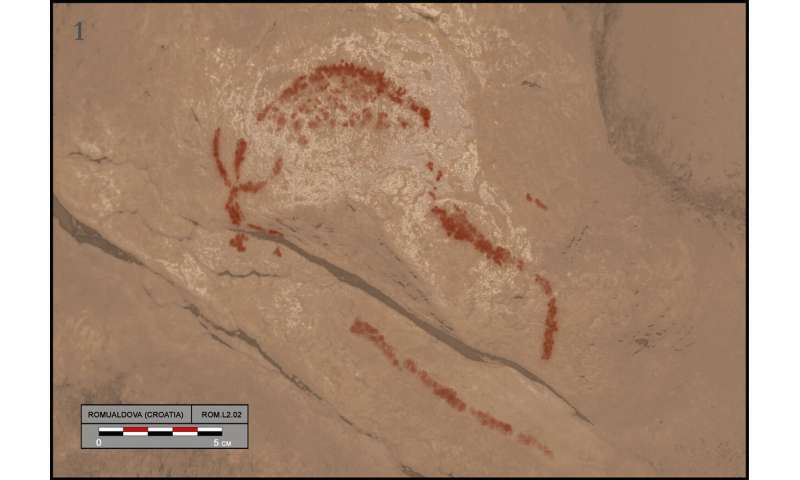 Dr. Aitor Ruiz-Redondo worked with researchers from the universities of Cantabria (Spain), Newfoundland (Canada), Zagreb (Croatia) and the Archaeological Museum of Istria (Croatia) to study the paintings, which could be up to 34,000 years old. The cave art was first discovered in 2010 in Romualdova Pe?ina ('Romuald's cave') at Istria in Croatia, when Darko Komšo, Director of the Archaeological Museum of Istria, noticed the existence of the remains of a red colour in a deep part of the cave. Following his discovery, the team led by Dr. Ruiz-Redondo and funded by the French State and the Archaeological Museum of Istria, with the support of Natura Histrica, undertook a detailed analysis of the paintings and their archaeological context. 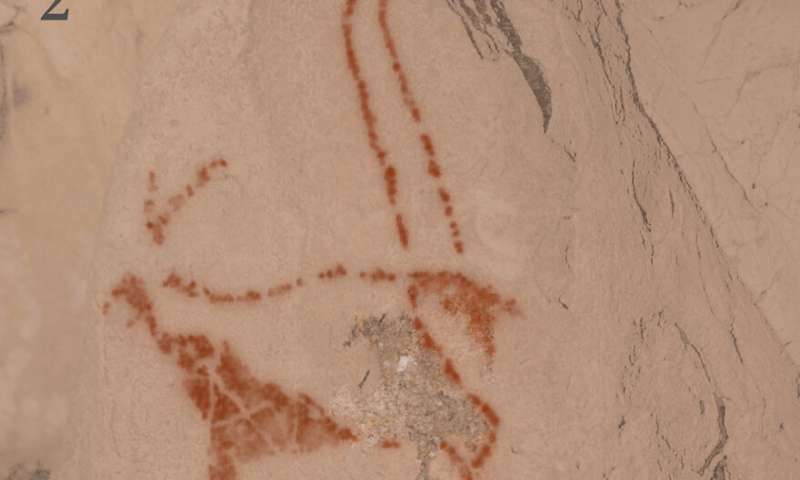 This led to the identification of several figurative paintings, including a bison, an ibex and two possible anthropomorphic figures, confirming the Palaeolithic age of the artworks. Furthermore, an excavation made in the ground below these paintings led to the discovery of a number of Palaeolithic age remains; a flint tool, an ochre crayon and several fragments of charcoal. Radiocarbon dating of these objects show an estimated age of around 17,000 years and other indirect data suggest the paintings date to an even earlier period—at around 34,000-31,000 years ago. 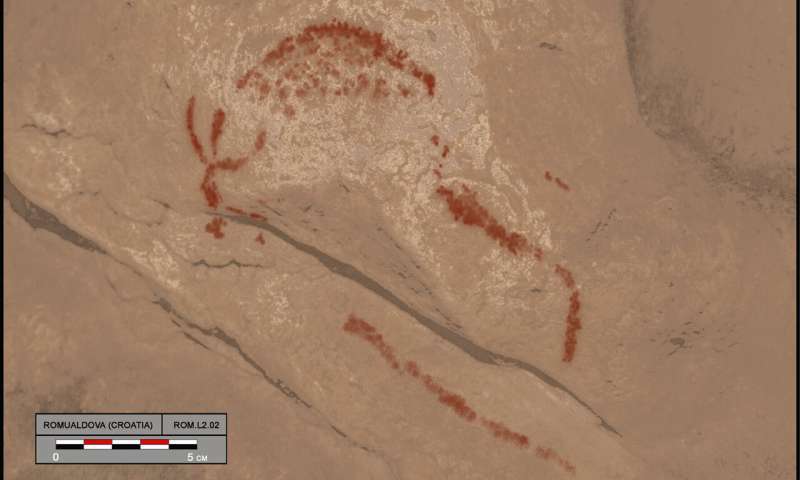 Further research will be conducted in order to establish the precise age of the rock art. Findings are published in the journal Antiquity. This discovery expands the so far sparse register of Palaeolithic art in south east Europe. It makes Romualdova Pe?ina the first site where figurative Palaeolithic rock art has been discovered in this area. Together with Badanj in Bosnia and Herzegovina, the two are the only examples of rock art from the Palaeolithic period in the Balkans. Dr. Aitor Ruiz-Redondo, a British Academy-funded Newton International Fellow at the University of Southampton and postdoctoral researcher at the University of Bordeaux, said: "The importance of this finding is remarkable and sheds a new light on the understanding of Palaeolithic art in the territory of Croatia and the Balkan Peninsula, as well as its relationship with simultaneous phenomena throughout Europe." A new project started by Dr. Ruiz-Redondo and his team, funded by the British Academy, will develop further research at these two sites during the next few years.